It’s that wonderful time of year again when snowflakes fall, and festive lights brighten the sidewalks. 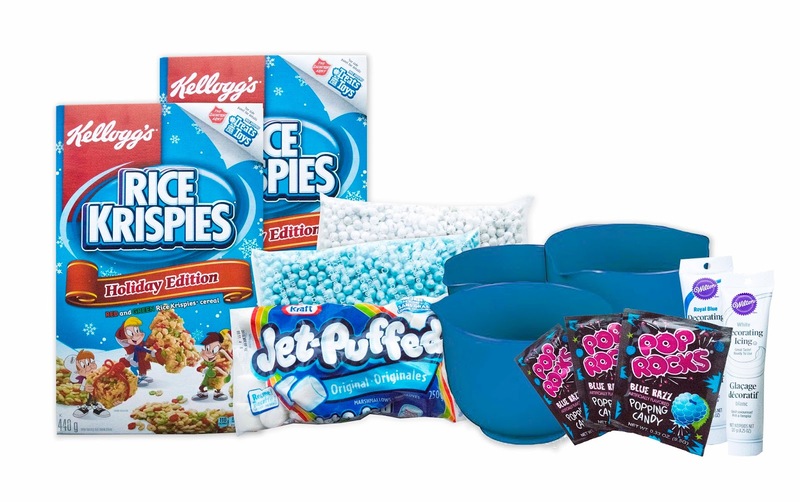 It’s also time to celebrate the fifth annual Kellogg’s Rice Krispies #TreatsForToys program! To ensure no child goes without the magic of the holidays, the Kellogg’s Rice Krispies #TreatsForToys program has once again partnered with The Salvation Army to encourage Canadian families to create a toy-shaped Rice Krispies treat and submit a photo on TreatsforToys.ca or share it in social media using the hashtag #TreatsforToys. For every photo uploaded or shared on social, Kellogg’s Rice Krispies will donate $20 to The Salvation Army for the purchase of a real toy for a Canadian child in need during the holidays. Make. Share. Give. These three simple steps will help create lasting memories for children to cherish for a lifetime. We’re also offering all our Canadian readers a chance to enter a great giveaway to have fun with their children, nieces, nephews, grandchildren, etc .. The giveaway is a great holiday Rice Krispie Pack from Kellogg's, as seen in the photo below. A random draw will be made by Random.org on December 8, 2017 from all Canadian entries received. Leave your contact info telling us who you'd make holiday Rice Krispie treats with this holiday. One entry per household allowed. Best of luck to all! Happy Holidays! I would make some race cars with my kids! I would make Rice Krispies treats with my sons. They would be extra excited about the Pop Rocks! I would make Rice Krispies treats with my cousins! I would make #treatsfortoys with my daughter and we would make a dinosaur part 2. I would make them with my son and daughter! I would make the Rice Krispy treats with my son. He loves making stuff with his mom. I would make these for my son and daughter! Yummy! I would make them with my daughter, she loves helping me in the kitchen. I would make them with my niece, she wants to make WonderWoman this year! Contact: twitter @tracydeanne. Thank you, happy holidays! I would make them with my nephew. He is autistic and loves treats. I would make them my special little one that I watch sometimes jfitze@hotmail.com . I would make them with my grandchildren. Fun!! Florence Cochrane @fossie55 on twitter. I would make them with my children. They love decorating and using sprinkles on food. I would make Rice Krispie treats with my 2 girls! I would be making Rice Krispies treats with my daughters just like what we do every year. I would make a Santa with my little granddaughter. I would make rice krispies treats with my little grandson. I would make Rice Krispie treats with my boys. I would make these with my grandchildren! My kids would love them. graemejmcgaw@gmail.com thanks! I would make them for my daughters class...and my niece and nephews. I would have a nice day with my niece and nephew! I'd love to make these treats with my kids. Goey, buttery delightful shaped Rice Krispie treats for my grandson at University who will share with his friends. I'd make a holiday train with my kids. I would love to make this with my kids! I would make holiday treats and rice krispie squares with my family. Happy Holidays!! I'd probably make them by myself. I'd make Rice Krispie treats with my sister. I would make holidays treats for my husband and I along with any guests that come over for the holidays like my inlaws. My mom! We will design an igloo and make snowflakes. I'd visit my niece and make Rice Krispie treats with her four children. I would make holiday Rice Krispie treats with my nephew's little girl. I'd make them for my family to enjoy! Hi, I would make them with tanya. Contact me at jrich27@sympatico.ca. I would make them with my daughter and my nephews. I would make treats with my little cousins. I'd make treats with my daughters & husband! I would make treats with my grandchildren over the holidays. They all love to cook with Nana. I would make a snowman with my twin girls. They are starting to really get keen about helping in the kitchen! I'd make them with my niece and nephew. Today's winner- sorry- we're a bit late on the draw!